* Adorn your wedding hairstyle with Mariell's magnificent Art Nouveau Bridal Headband featuring a side design of slender pave crystal leaves and delicate fans. * This vintage wholesale headband looks like a royal diamond and platinum heirloom and will add retro Hollywood glamour to any wedding! 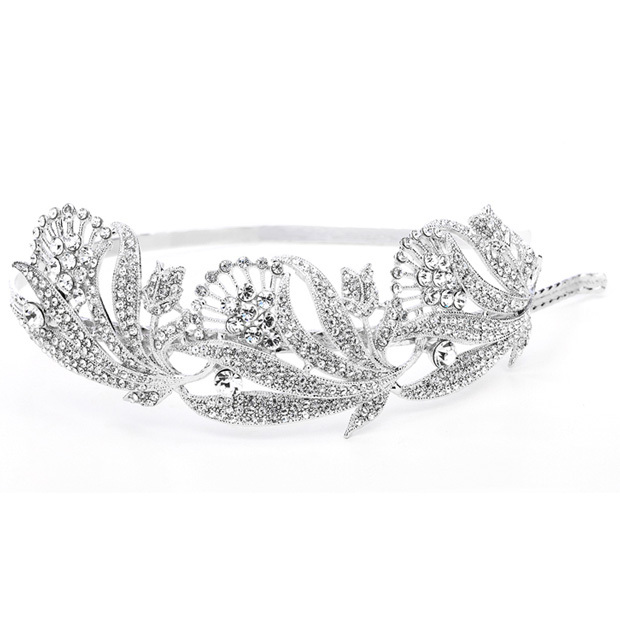 * Our antique silver rhodium Bridal Headband looks like a royal diamond and platinum heirloom. * The pave crystal side design of slender leaves is 6 3/4" along the elegant etched band & is 1 1/2" w.
* Add couture Hollywood glamour to your wedding hairstyle!